If unions lose Friedrichs, the nuclear fallout might ruin unions for a generation, or more. Some unions seem shell shocked by the existential threat posed by Friedrichs, paralyzed by the Court’s intention to declare total class war. But war demands either surrender or a fight. A red alert should be broadcasted across every union hall in the country and to the broader public, since Friedrichs is an attack on all working people. Union memberships must be educated about the dire urgency of Friedrichs, and be engaged in creating and implementing the strategy to defeat the enemy. By directly engaging members and publicly mobilizing BEFORE the decision in June, Friedrichs can be defeated. Ms. Henry surely knows the Supreme Court is a political institution that is affected by political pressure. And SEIU members deserve a leadership willing to apply massive pressure, by any means necessary. An anti union Friedrichs decision is not inevitable. The AFL-CIO leadership seems equally frozen by inaction. The AFL-CIO President, Richard Trumka, also went AWOL in the Friedrichs fight. Trumka released a short video of him denouncing Friedrichs and telling people that they could learn how to “fight back” by visiting the website “America Works Together” (apparently he didn’t have the time to explain the strategy in the video). The America Works Together website is bare bones, and uninspiring. The only thing resembling “fighting back” is a petition, directed against the anti-union group The Center For Individual Rights, which is providing the legal support for the Friedrichs case against the unions. Of course, petitioning your enemy to stop attacking you isn’t very effective. And If the AFL-CIO is only using this tactic in the face of an advancing Friedrichs, their petition will be as useful a weapon as a white flag. On the other side of the fight is the plaintiff, Rebecca Friedrichs, who has been 100 times more vocal in publicly opposing unions than the unions have been in publicly defending themselves. Ms. Friedrichs is all over the TV blasting away at unions, who steadfastly refuse to return fire. Sure, Ms. Friedrichs uses half truths and lies in her attacks on unions, and yes she is backed by large corporate groups, but her tenacity is exactly what the union leaders are missing. While Ms. Friedrichs boldly denounces unions the union leaders seem ashamed to show their face in public to defend themselves, let alone lead a counter-attack. Luckily, there is more to the union movement than its semi-celebrity leadership. The de-facto leaders of the national union movement are now the Chicago Teachers Union, and the various teacher unions who’ve copied the CTU model of engaging rank and file members and fighting back publicly against the attacks on teachers and public services. This is the way forward. The example of the Chicago Teachers Union (CTU) should be mimicked by every union, and the book, “How to Jump Start Your Union,” about their organizing tactics should be required reading for every union officer, activist, and staff member. The Chicago teachers rebuilt the union with member engagement and participation, while successfully appealing to the broader public for support. Because of their successes, the CTU is less vulnerable to Friedrichs than other unions. After a very public teachers’ strike in 2012 that shut down the Mayor’s anti-union proposals, the union is mobilizing again for another strike, expressing the latent strength of all unions, as the Supreme Court is testing this strength with Friedrichs. The twin strategy of building a fighting membership by defending their interests and rallying the public by defending their interests as well is the recipe for a strong union movement, while the top down, business as usual unionism is dead, since the disengaged membership it creates weakens unions, making them vulnerable to the Friedrichs assault. Strong unions demand an active and engaged membership, where members play a significant role, have a strong voice, and are meaningfully engaged in other ways. This also requires a return to participatory democracy, where members actually feel that they are the union, instead of a small clique making all the decisions. The teachers responded to injustice by shutting down the school system; the threats of the Chicago Mayor were trumped by the actions of the teachers. People thought the mayor’s attacks were “inevitable,” until the CTU mobilized and rallied the public. Friedrichs must be fought in the same manner. Every historic victory of organized labor was won with “no justice, no peace” at its foundation, and every other organized group of oppressed people used the same approach to win power; women’s rights, civil rights, and LGBTQ rights required militant organizing that threatened “social peace” if justice wasn’t delivered. This is the only way to fight Friedrich’s, since it was how unions won the decision that Friedrichs seeks to destroy. When unions won “Abood vs Detroit” in 1977, it was the culmination of years of mass strikes in the public sector, where public transportation grinded to a halt and teachers shut down school districts, demanding the dignity that comes with strong unions. The pro-union Abood decision wasn’t a gift from the Court, but a recognition of the existing power that unions were actively expressing. The 1977 Supreme Court said publicly that the Abood decision was, in large part, motivated in order to deliver “social peace.” And after the Court gave the unions justice, the unions gave the government peace. Unions are under attack now precisely because they aren’t viewed as a potential threat. But there is still time to show that the Court has misjudged union power. The Court will not decide Friedrichs till June, and until then labor remains on the battlefield; if unions engage and mobilize their memberships to strike preemptively, it may lessen the blow of Friedrichs, while a powerful strike could avoid the blow completely. In Oregon SEIU 49 and Portland Jobs With Justice passed a similar resolution, as did the Northwest Oregon Labor Council, which specially called for May 1st to be the day of national action. An “open letter to the labor movement” is now being circulated that calls for May 1st to be a national day of action against Friedrichs. Mass mobilizations on May Day is entirely possible, if unions join with the immigrant rights groups and others who already are planning these rallies in most major cities. A massive show of force is possible before the Supreme Court decides Friedrichs. And if unions show up in force on May Day, they can use the platform to threaten even more aggressive actions if the Supreme Court decides against them. Doing nothing, however, can have devastating effects. An army that loses a decisive battle without firing a shot can be permanently demoralized, since basic human dignity demands action in the face of injustice. If the union is projecting weakness, members will internalize these weaknesses. And nothing screams “weak” such as sitting idle while someone kicks your teeth in. 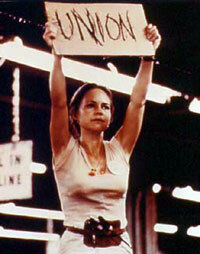 When the union acts powerfully, the members feel powerful; strong unions defend themselves. And they defend their community against corporate attacks. Just as the Chicago Teachers Union has been a powerful voice against the privatization and defunding of public education, so should all unions be a voice for the community in the ongoing fight against low wages, high rents, the poisoning of Flint’s water, and other issues that are devastating working class people across the country. Ultimately, unions must be transformed back into the mobilizing and fighting organizations that earned them the rights the Court is now attempting to take away. May 1st could be known as the rebirth of the labor movement, or the Court’s decision in June may mark its terminal decline.